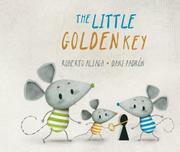 This Spanish import presents the day that three mice find a key and speculate on what it might unlock. When the Mouse brothers emerge from their cheese-shaped house in the forest, each has a different idea about how to spend their Saturday. The oldest wants to pick apples, the middle one prefers poppies, and the youngest wants “that little piece of the sun that’s fallen onto the ground!” Realizing the “little piece of sun” is really a key, the siblings imagine opening a pirate chest or a castle door, but the smallest mouse decides “it must be the key to happiness!” Since the mice don’t know how to find the happiness it unlocks, they go home to consult their mother and discover her searching for this very object. Connecting the themes of their play, they posit that their dwelling holds treasure, compares to a castle, and is filled with joy. The story suffers from a trite ending, predictable plot, and (for the most part) pedestrian language: “It’s a very old key; I’m sure it opens the door of an old castle!” The illustrations, which appear to be digital, are stronger. Padrón’s close-ups are so revealing that readers can view tiny mouse hair in the profiles. He creates a successful depth of field with mist-shrouded trees in the background and warm, textured images in the foreground.